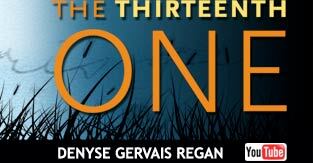 Kaleidoscopic, magical and real, The Thirteenth One makes its luck as it celebrates the true tales of a huge family growing up during the Depression and the 1940’s. 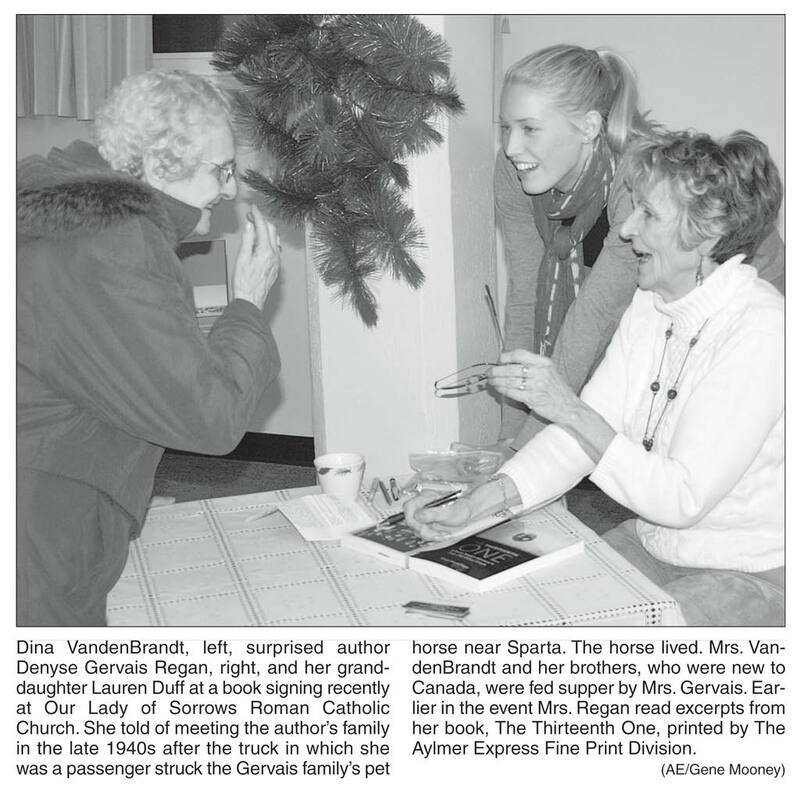 Keeping track of which member of the epic Gervais family is remembering which mishap, tragedy, joyous encounter or simply the whereabouts of the communally shared chewing gum is almost impossible and always fun. 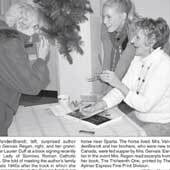 Denyse Gervais Regan’s lovingly recalled memories have already formed a play staged at the Blyth Festival. Scenes are included here. But there is drama everywhere in The Thirteenth One’s episodic flow. Many chapters are read-aloud material. There is a girls’ baseball team in Gypsumville, Manitoba that truly is in a league of its own, a recipe for tourtiere, remedies for childhood illnesses and an eventual journey to a new beginning set in a place with an ancient and heroic name...Sparta...Sparta, Ontario that is. 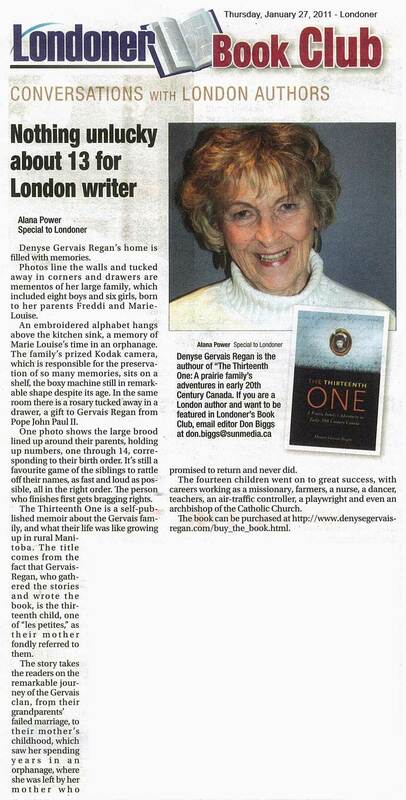 There is something Spartan about Gervais Regan’s family as she recalls their valour and glory decades later. Not that Denyse would ever feel the need to hammer that connection into place. She can count on the good fortune (once in the guise of Timothy Eaton) that shines, despite many dark moments, on The Thirteenth One to light the way. 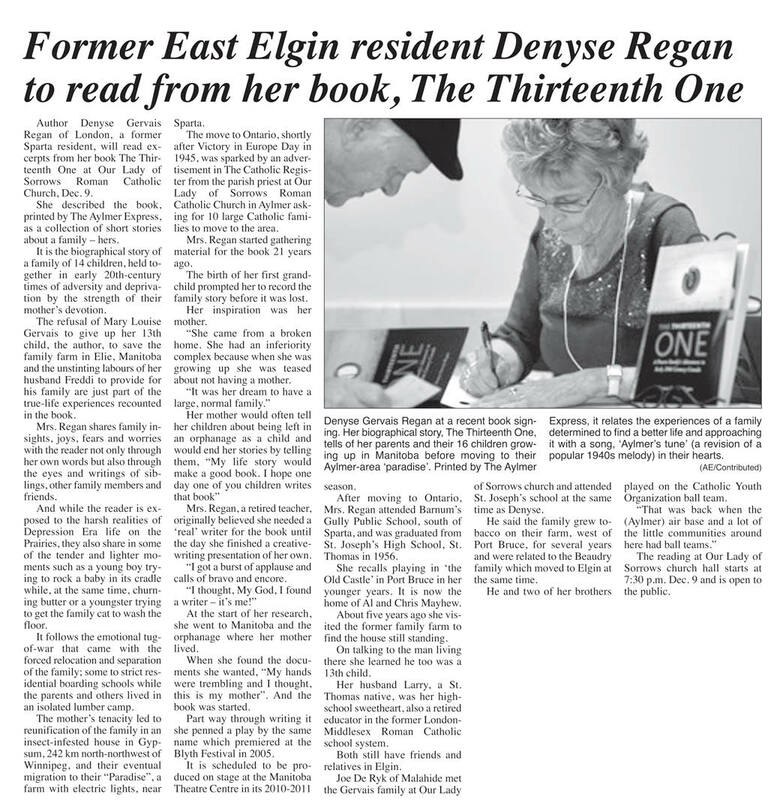 Denyse Gervais Regan takes the reader on sweeping tales of adventure, heartbreak, and love, made all the more poignant because they are true. 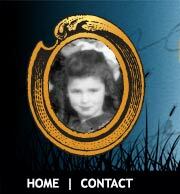 This book captures an era of Canadian family life rarely visited before with such affection and honesty. 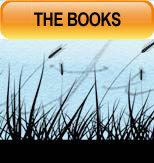 A wonderful read for book lovers of all ages! Louise Fagan: Producer, Director and avid reader. 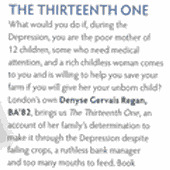 Gervais Regan presents her rich family history in vignettes full of humour and searing heartache. 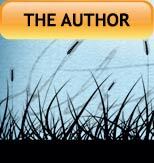 She is a fine story-teller, relating her most beloved, personal tales with great affection and insight. This reader felt as though he was leafing through family photo albums while hearing the secrets behind every scar, every tense grimace, every mischievous smirk. 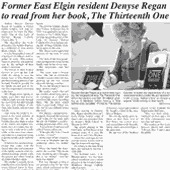 Denyse Gervais Regan follows the writers’ credo beautifully: she writes what she knows. 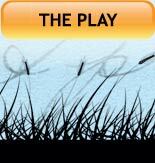 What’s more, she writes passionately, embracing both the challenges and joys of family life. Her devotion, not only to her own family, but to the broader cultural importance of family, is an inspiration. 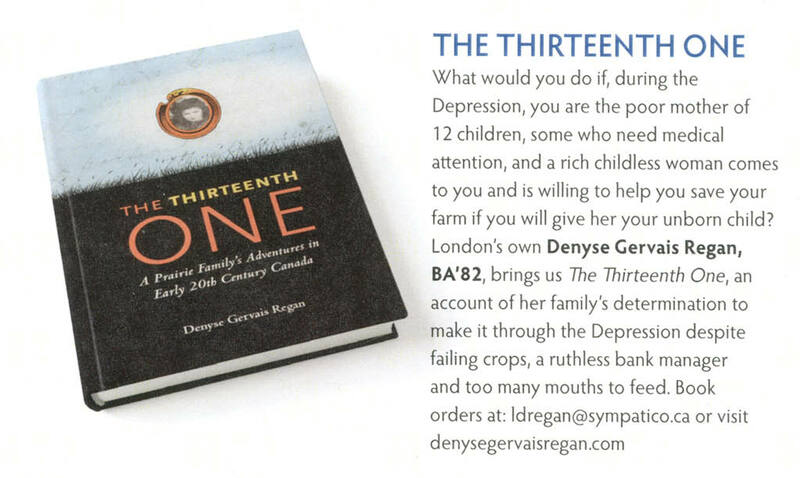 If everyone followed Denyse’s example and took the time to pay compassionate attention to the lives, times, tragedies and triumphs of family, I suspect the world would be a better place. I am there with the family, the author’s mother as a young girl, cheering on their jigging father to a $25 first prize at the St. Eustache fall fair -sharing the sights and sounds- a welcome happy moment with death around the corner from flu that claims a neighbor’s child. Memories of happiness and pain are woven in a tapestry of hard work, love and perseverance that survive and thrive though future generations. For anyone who remembers the thrill of the Eaton’s catalogue arriving as a child and dreaming of things your family couldn’t afford, this book is for you. It reminds you of what made Christmases past worth remembering: music, family, feasting and fun. Like the author’s sister, Majella, I remember ordering my first radio from the catalogue. I’m too young for Foster Hewitt’s era but hearing Majella’s “Tale of the Cow’s Tale” took me back in time. What do you do when a cow’s tale falls off? And how do you hide that from your father? Necessity is the mother of invention and it’s amazing what fun you can have with 10 coupons from the neighbour’s newspapers and song on the radio. There is no shortage of stories from a family of 14 children who stuck together through tough times, disease, hard work, laughter and celebration. Smiling black and white photos and hand-drawn pictures throughout the book by grandchildren help punctuate the tales handed down through the decades that resonate still with the new generations. 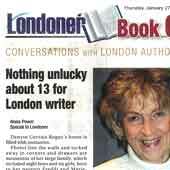 You’ll only be hungry for more tales from a wonderful author, the 13th One, who calls London her home. David Scott , Editor of Alumni Publications for the University Of Western Ontario; Playwright, author of “The Ballad Of Stompin’ Tom’, which premiered at the Blyth Festival.